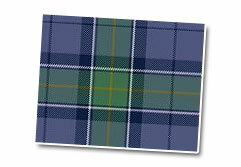 This tartan was created as a State tartan by the St Andrews Society of Rhode Island Inc. The Society was founded in 1923. Claire Donaldson of House of Edgar (Woollens) Ltd. / Scottish Tartans World Register: Rhode Island, The State of Rhode Island.